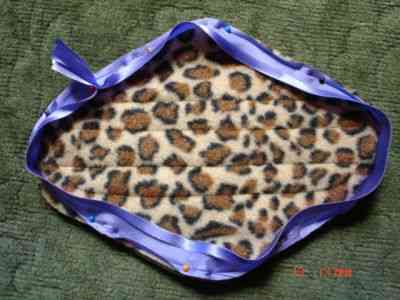 There are lots of reasons to make your own menstrual pads: environmental benefits, save money, you can make pads to suit your own needs, they are very comfortable to use, and above all they look beautiful and it’s great to make and then use them. 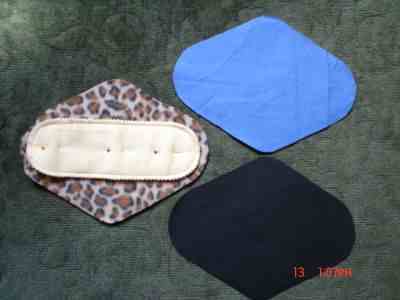 You can make your pads any size you like, to suit your needs. Here are some patterns though if you need a little help to start with. It’s washable and breathable. This is optional but I like the security of having it there. 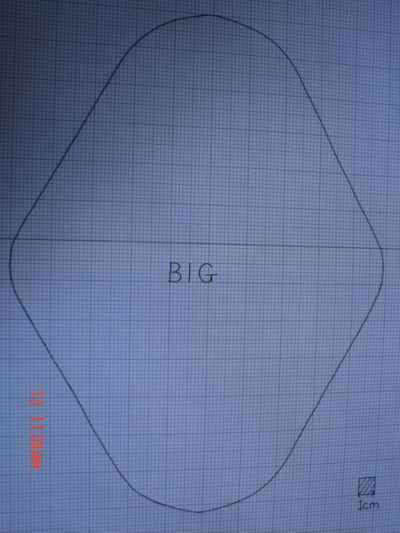 Top layer - you can use cotton flannelette or fleece. 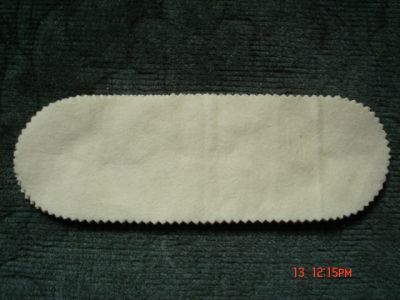 The cotton is good but can wick blood to the edges of the pad. 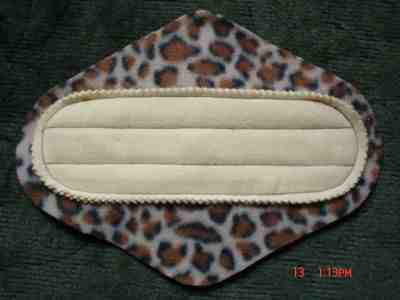 Fleece lets the blood straight through and onto the absorbent inner pad so I prefer this; it also seems to wash better. 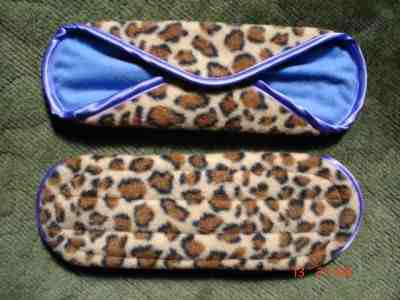 Next you cut the fabric for the inner absorbent pad. I have used a thick flannelette sheet mostly, and used 4 layers. 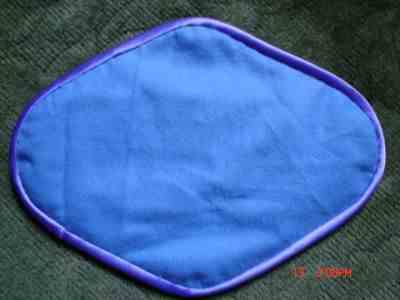 For night time and/or heavy days, I have made some inner pads of towelling fabric which is more absorbent but slightly more bulky. Place all the inner pad pieces on top of each other and sew round the edge. 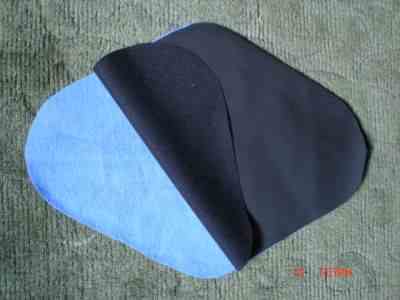 Pin inner pad of flannelette or towelling onto WRONG side of top layer. 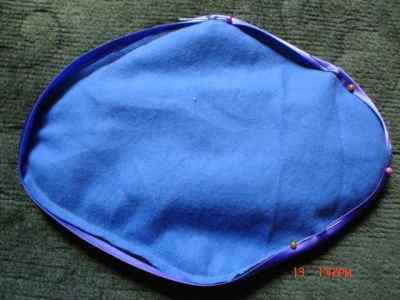 Sew inner pad onto WRONG side of top layer, round the edge and also a couple of lines of stitching in the middle if you want to. (I draw in the stitching lines with pencil otherwise I find they go a bit wiggly). These are the pieces you should have ready now. Place the waterproof layer on top of the bottom cotton layer, I’ve shown it folded back a bit so you can seen which way the waterproof goes, it’s the slightly rubbery side to the top. 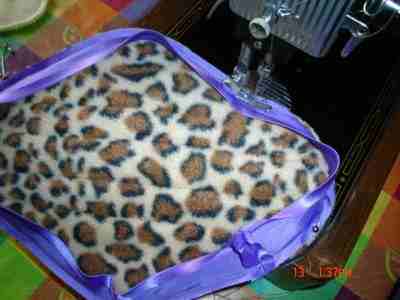 Now on top of the cotton, then the waterproofing, put the fleece with sewn on inner pad RIGHT SIDE UP, with pad inside. Pin bias binding (I used 19mm width), round the edge. Once you’ve sewn the binding on, pull the unsewn edge over to the wrong side (Cotton bottom layer) and pin it in place (you may need to trim the edge seam here if it’s a bit bulky). 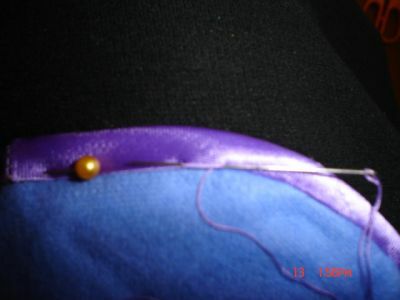 Slip stitch in place, here’s a picture of it being slipstitched and then how it should look when you have done this. 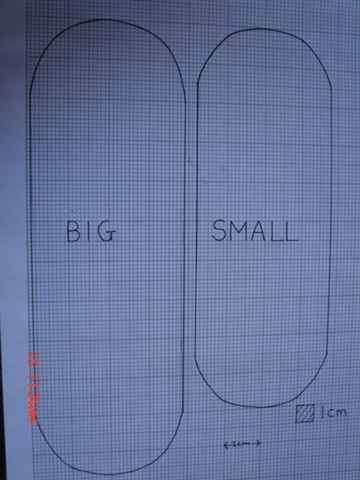 Here is a picture of the right (top) side of the pad at this stage. You can now top stitch the edge if you like and then sew on poppers or whatever you would like to use to hold the "wings" in place. I’ve used poppers but you can use Velcro or a button and loop. 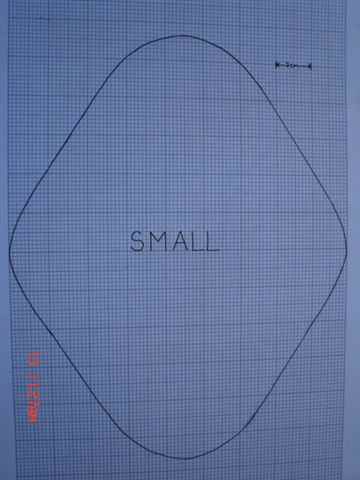 Here is a picture to show both sides of the pad. Here is a picture of how to fold the pads - this can be both for clean pads and for once they have been used so you can put them in a suitable little bag if you are away from home. 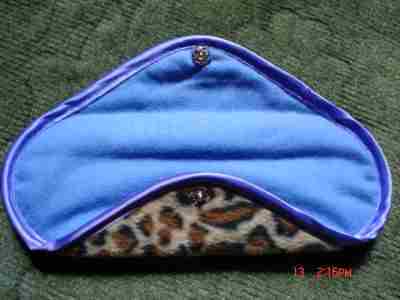 I use a make up bag from Superdrug which has compartments, one for clean pads, one for used. ?When you have used a pad, soak it in cold water until you are ready to do a wash. I wash mine at 40% in the washing machine and then hang them on an airer to dry but I think you can put them in the tumble dryer on cool if you have made them with the waterproof layer, warmer if not. Don’t use conditioner as this reduced absorbency. If you soak them you can use the soaking water on the garden as its good for plants. 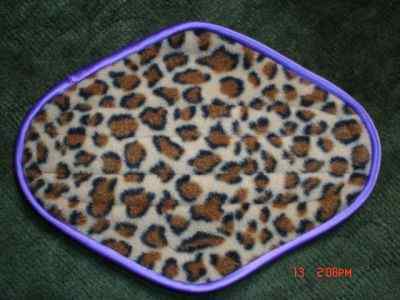 There are lots of other patterns and information available on the internet and you can buy pads ready made. 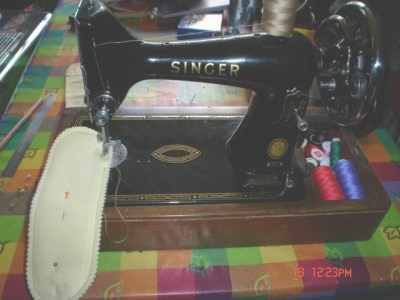 This is just how I have made pads to suit myself, the first ones I made where out of old t shirts and cot sheets, just to see if I could do it. 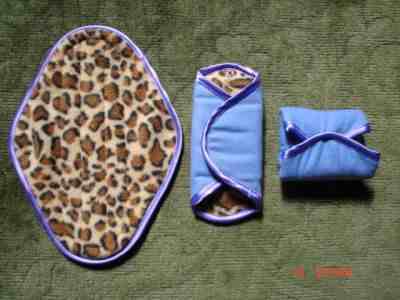 I hope you enjoy making and using your pads as much as I do, I only wish I’d have thought of doing this years ago! !